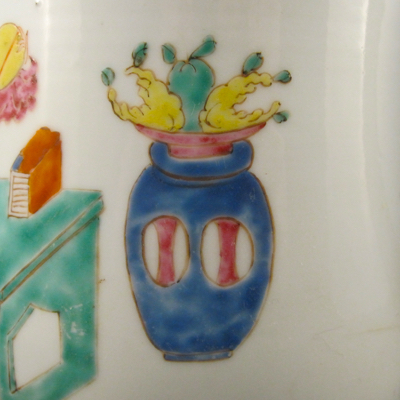 This is one of the more unusual transformation pieces I have in my collection. 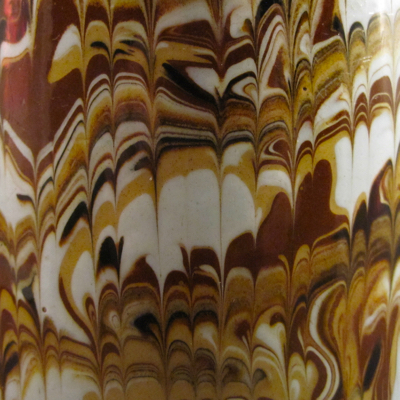 Much like the butterfly painted on the reverse side, it began life as one thing and transformed into something entirely different. 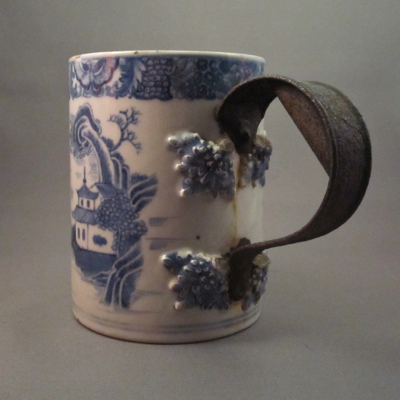 I call it a metamorphosis mug. 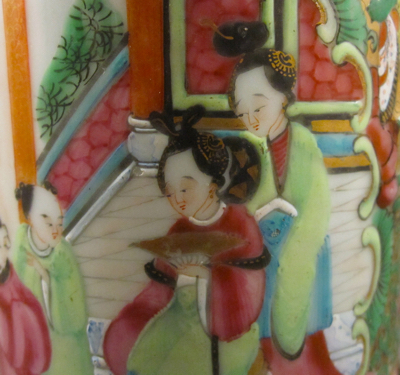 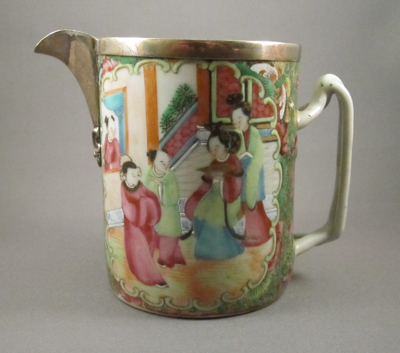 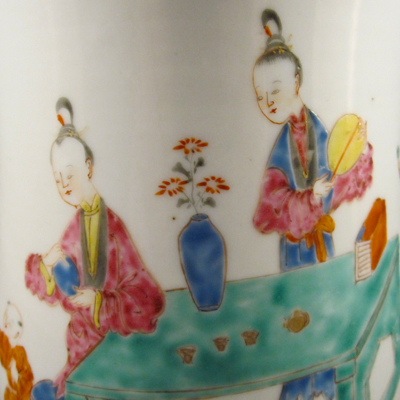 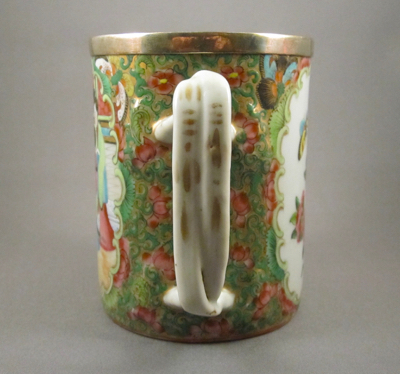 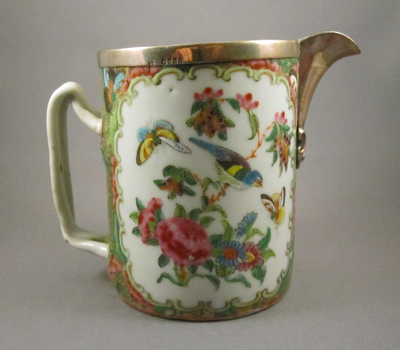 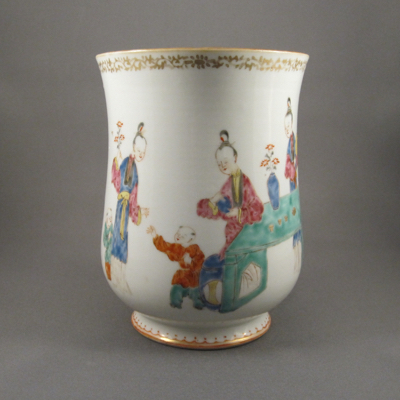 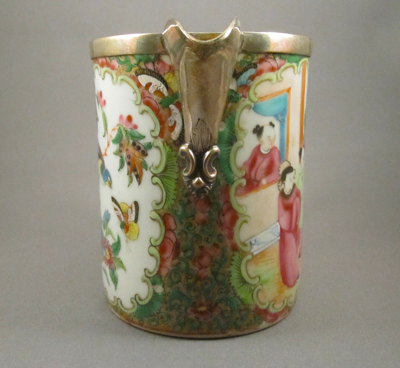 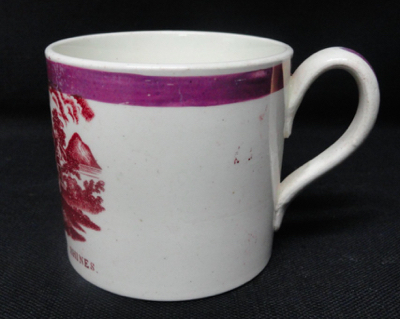 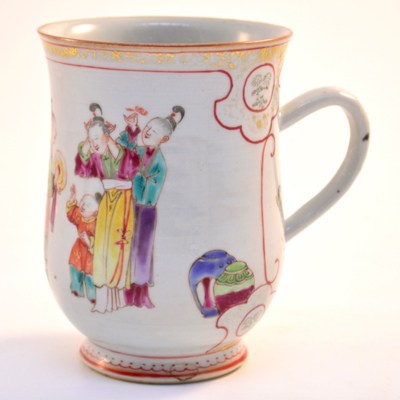 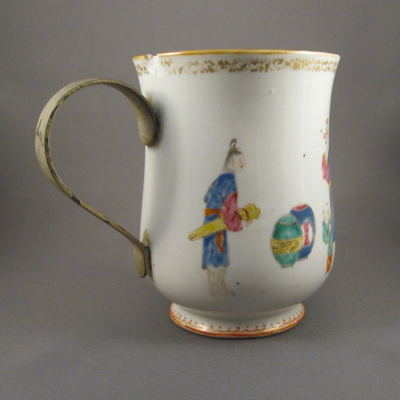 Made between 1830 and 1850, this Chinese export porcelain mug in the Famille Rose Mandarin palette was converted to a milk jug with the addition of a silver spout. 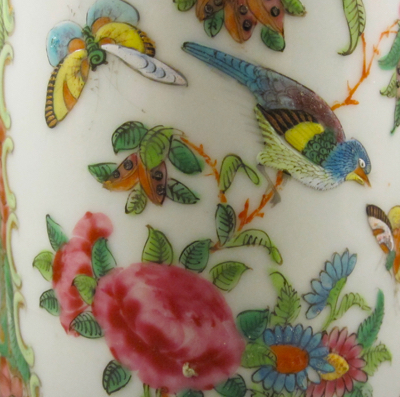 It has two decorated panels, one with a courtyard scene and the other with images of exotic birds, butterflies, fruits and flowers. 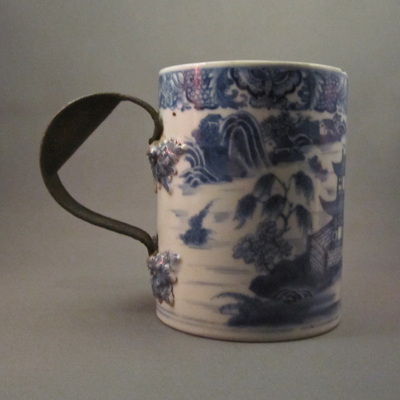 It stands 4-1/2 inches high and is 5-1/2 inches wide from handle to spout. 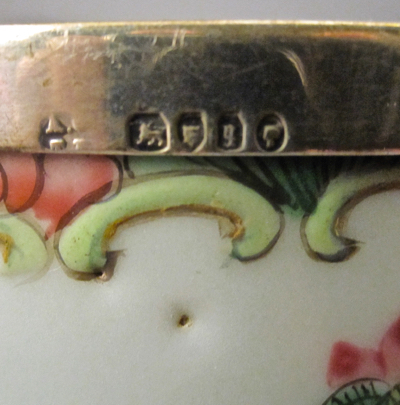 The silver mount has an 1871 London hallmark. 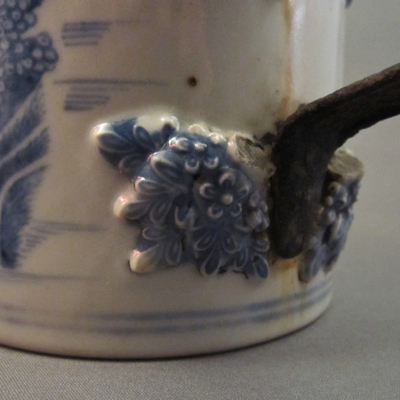 Although I have many examples of silver spouts, handles and lids, it is rare to find hallmarks that date and place a repair. 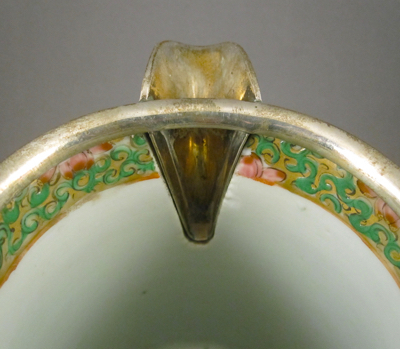 I particularly like the ornate sparrow beak spout. 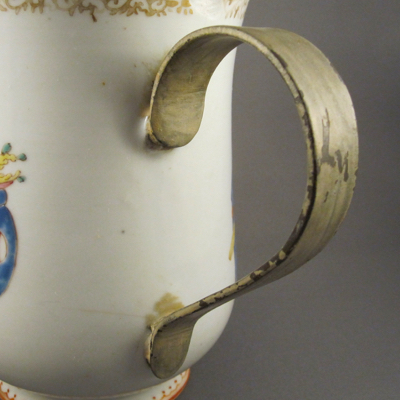 This mug was happy being a mug and felt no need to spread its wings and become a jug. 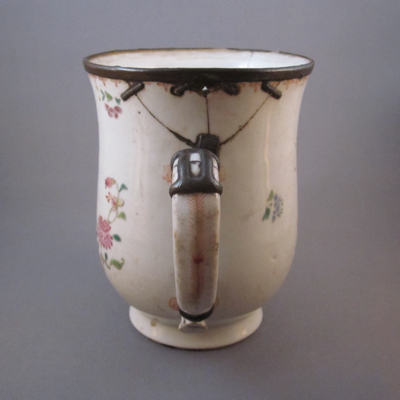 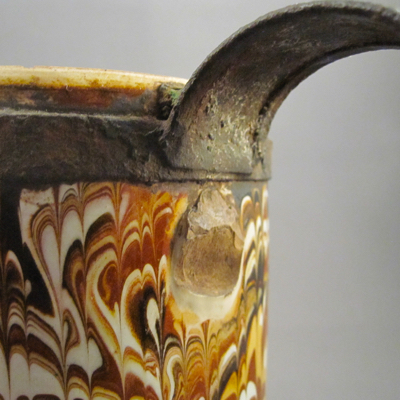 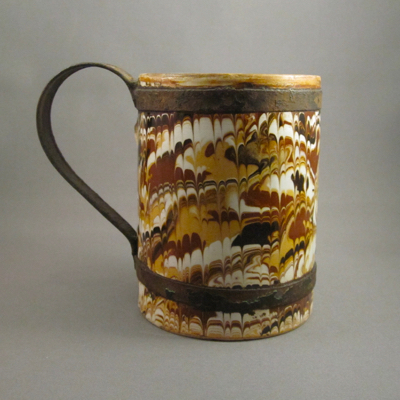 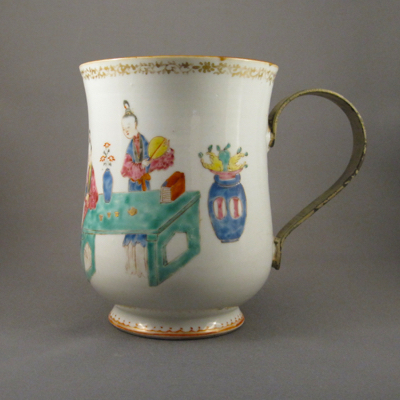 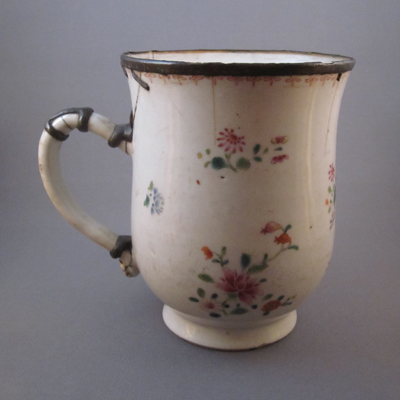 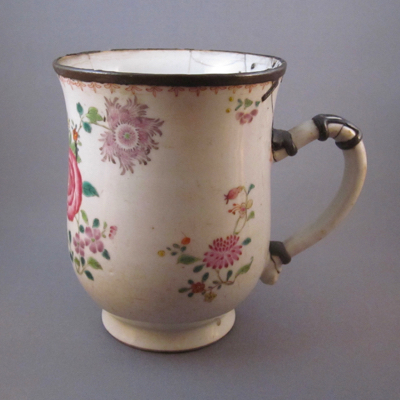 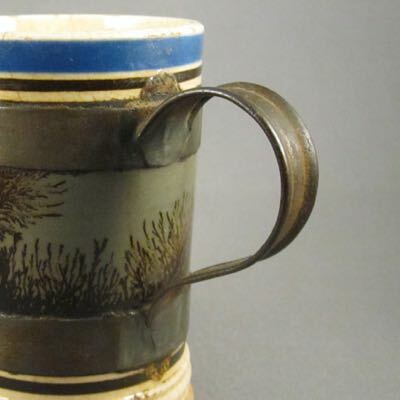 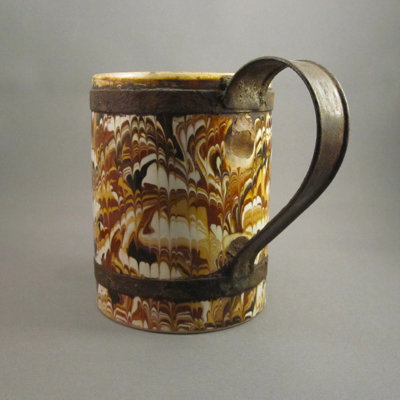 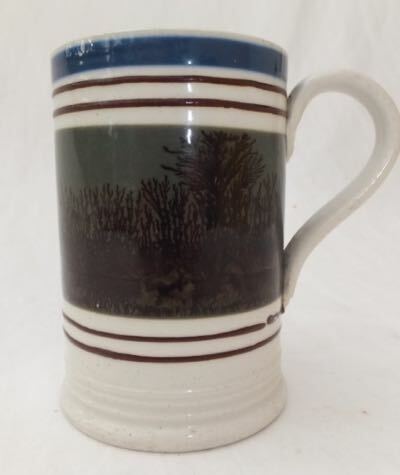 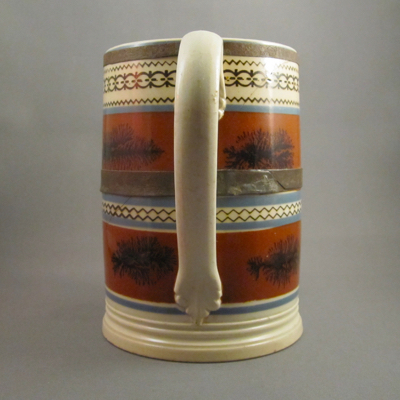 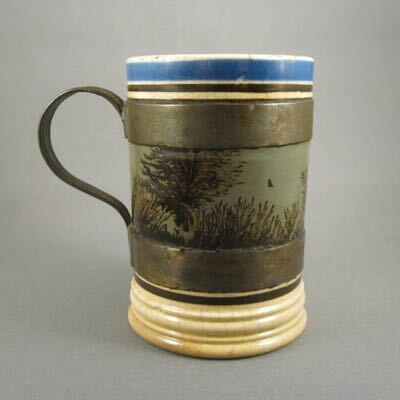 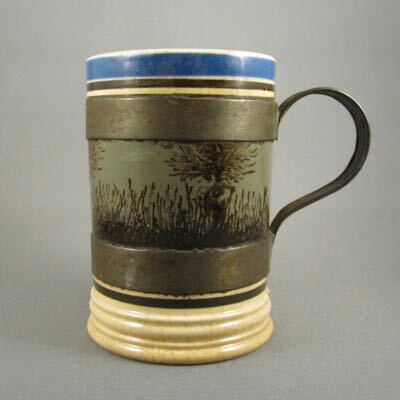 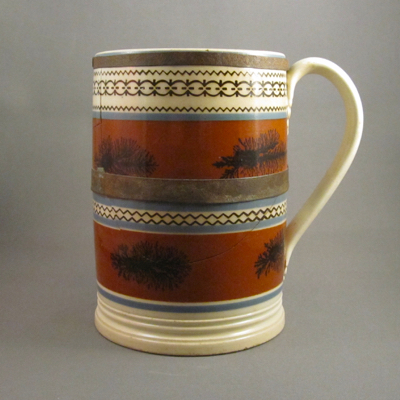 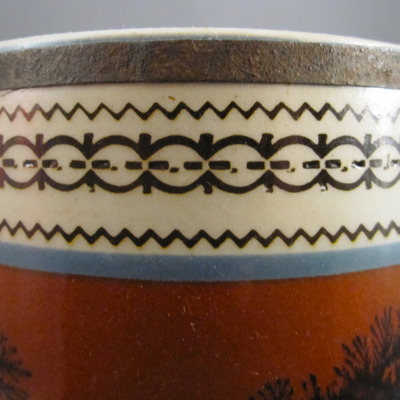 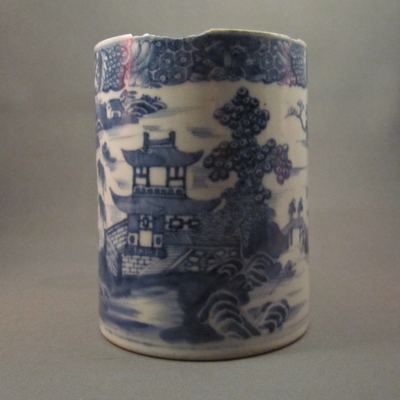 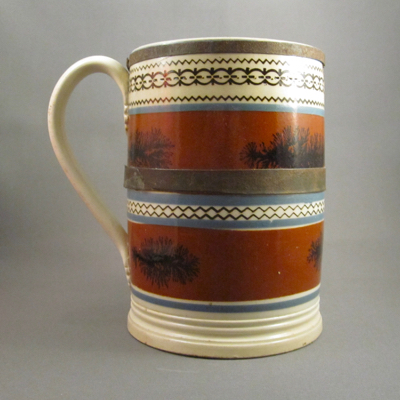 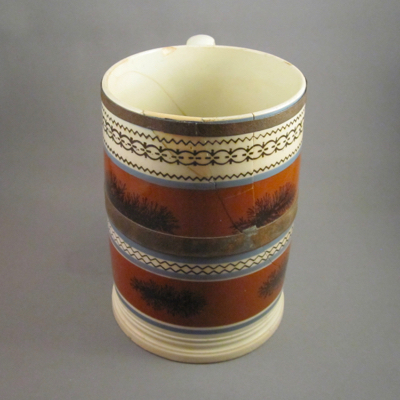 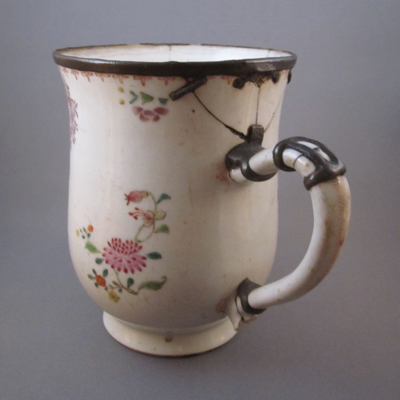 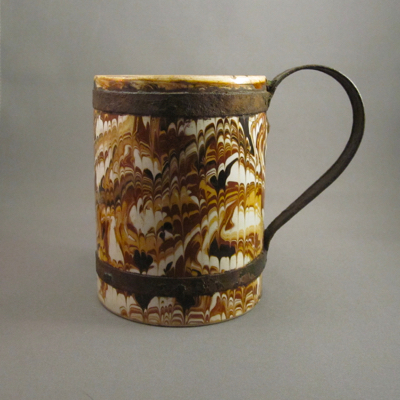 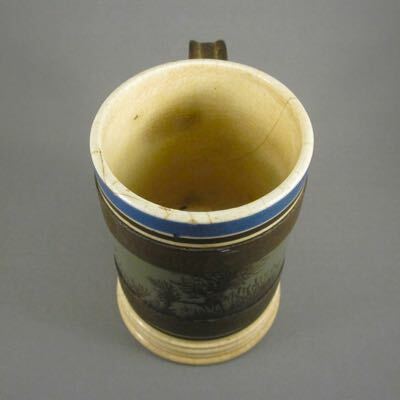 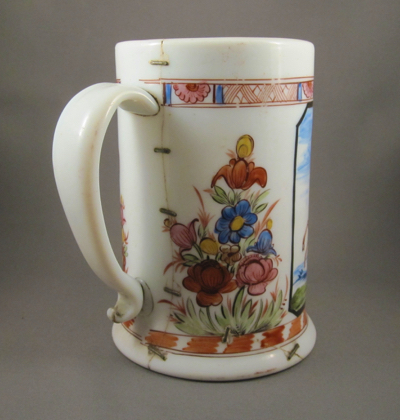 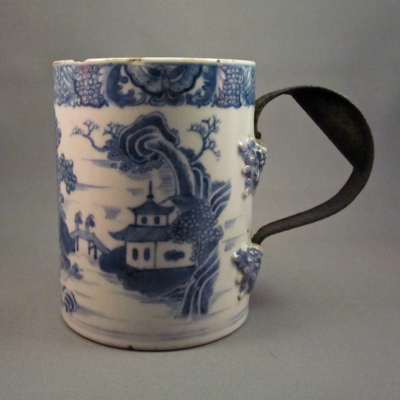 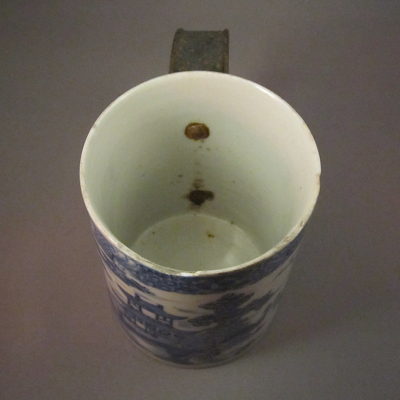 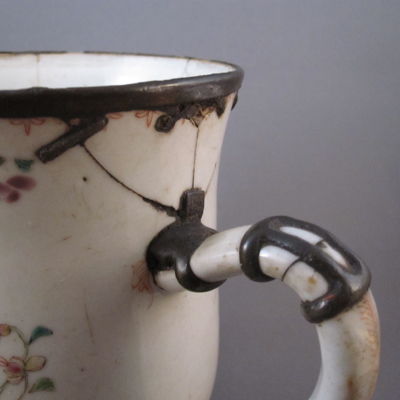 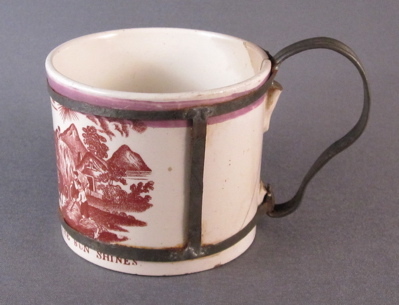 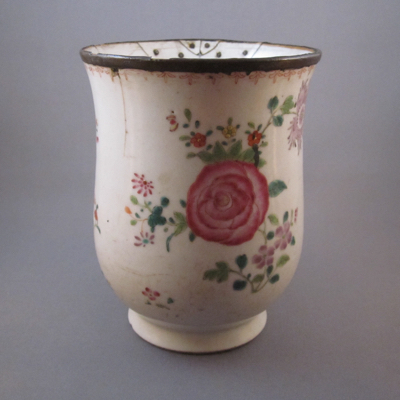 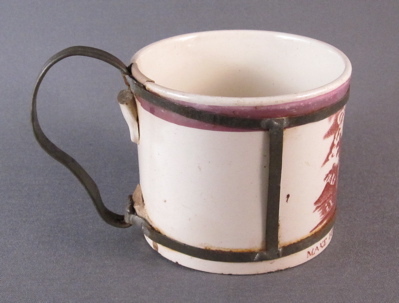 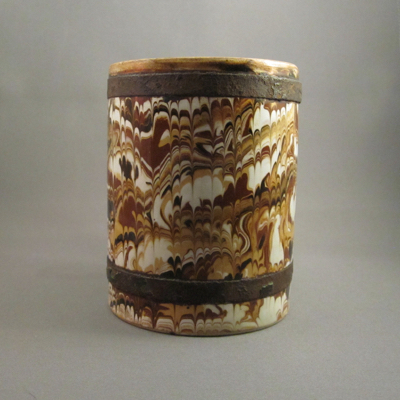 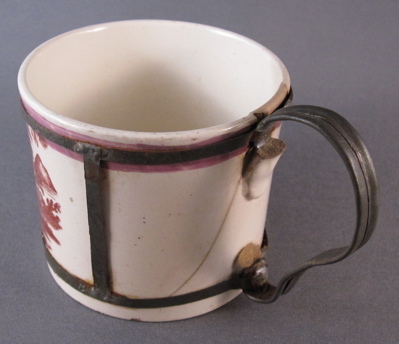 This small cylinder form mocha ware tavern mug was made in England in the mid-1800s and stands just 4 inches tall. 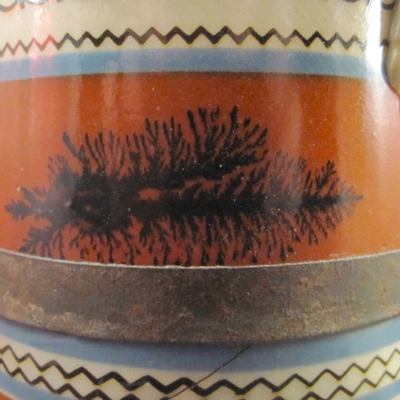 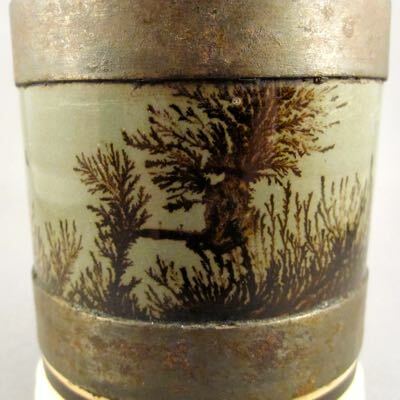 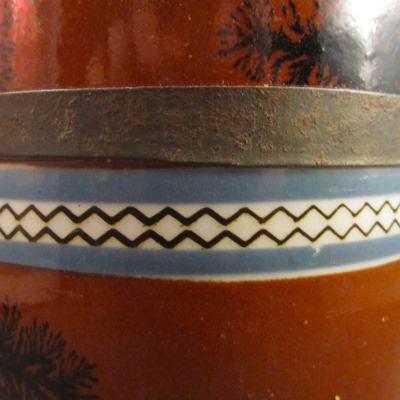 It is decorated with blue & black bands and a broad teal ground with a bold seaweed pattern. 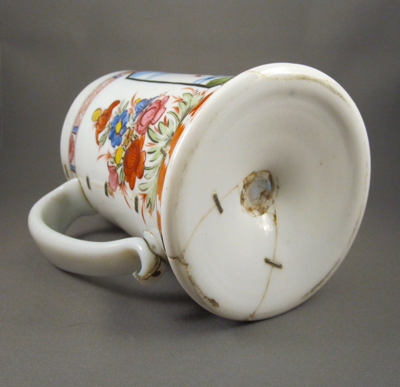 I’m guessing that the original handle of this mug broke off during a particularly rough bar room brawl. 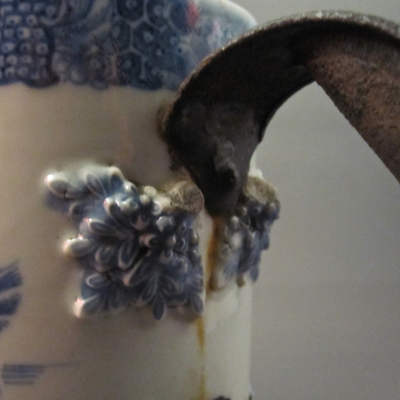 Luckily, a local tinker, sometime in the third quarter of the 19th century, was able to bring it back to life by adding an iron replacement handle with support bands. 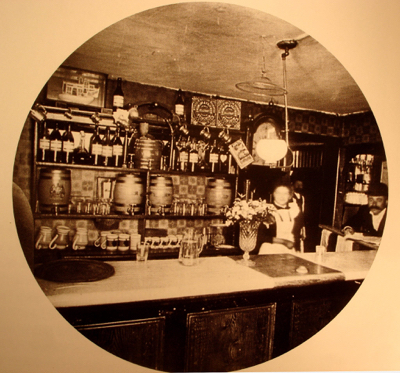 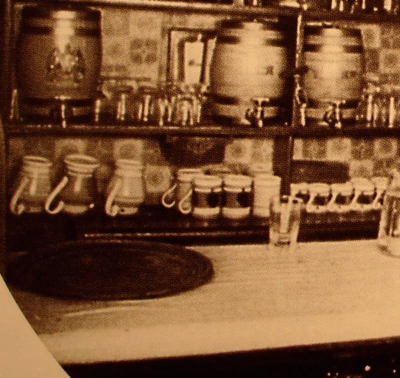 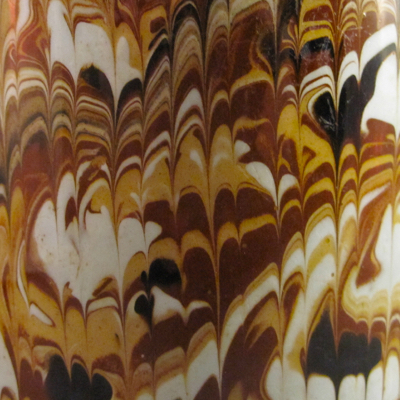 Similar mocha ware mugs and jugs can be seen on the bottom shelf behind the counter in this late 19th century photo. 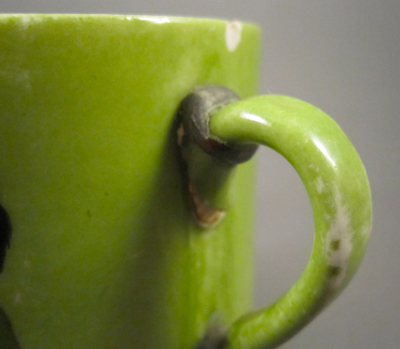 This is what the original loop handle on my mug would have looked like prior to the brawl. 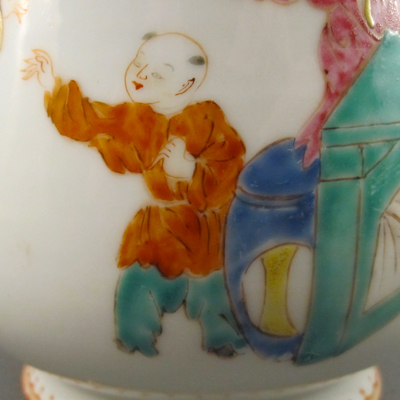 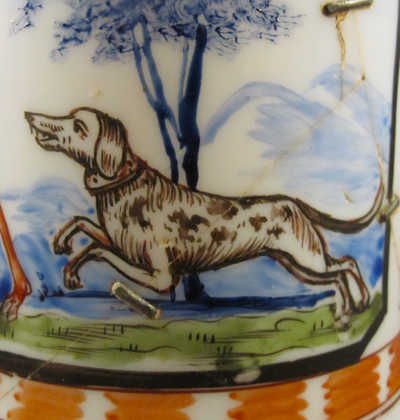 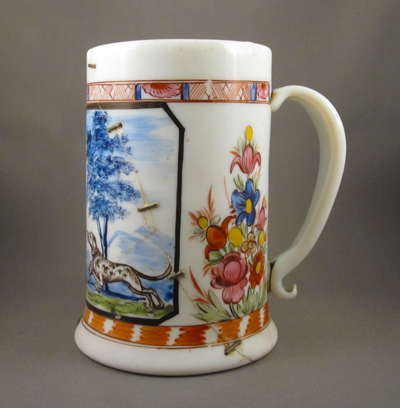 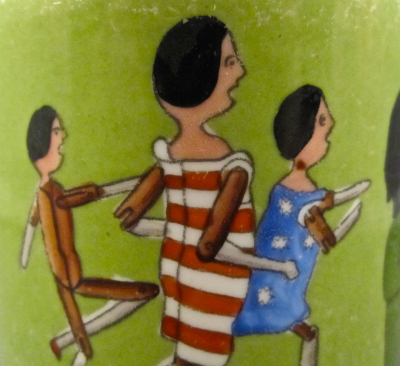 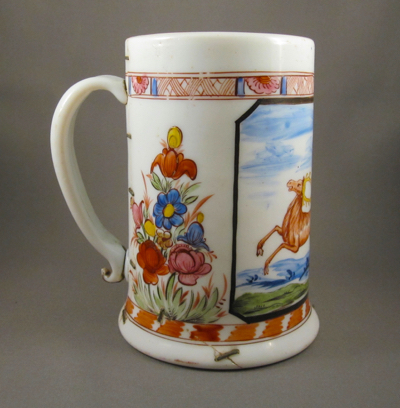 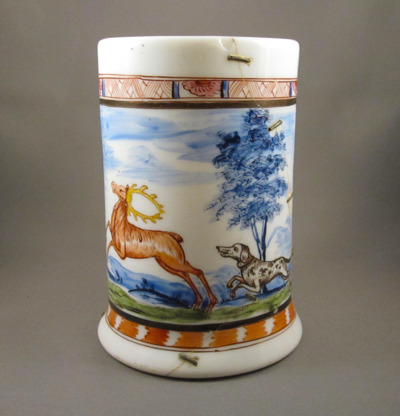 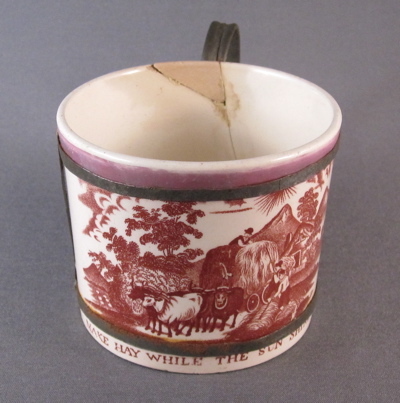 This 18th century Milch Glass mug with hand painted polychrome hunting scene of a stage pursued by a dog was made in central Europe in the 18th century and measures 6-1/4″ high. 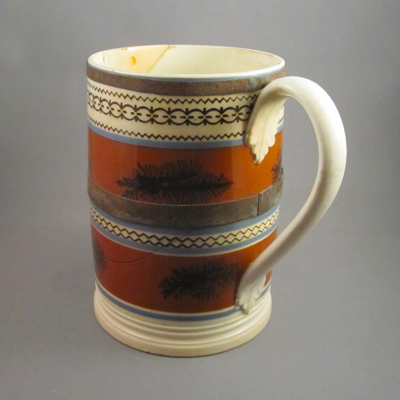 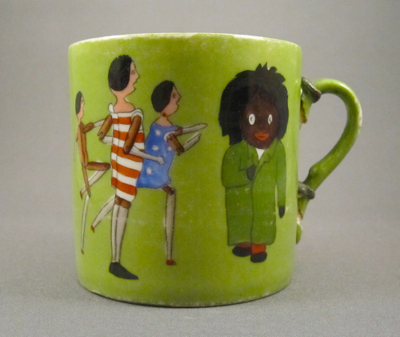 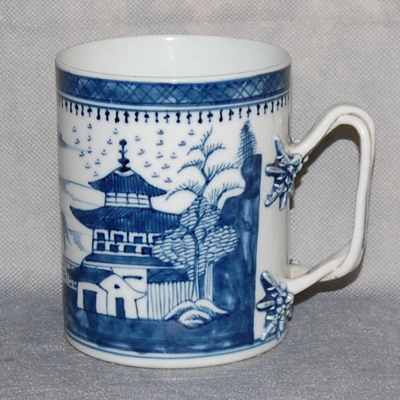 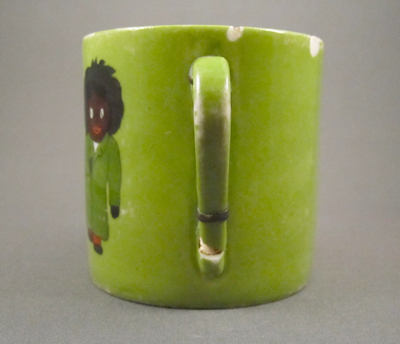 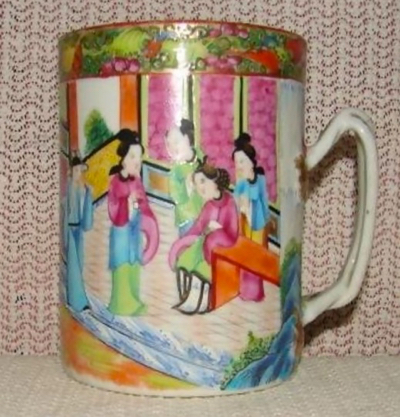 After this mug was dropped, breaking into two pieces, it was most likely taken to an itinerant china mender who repaired it using 16 metal staples of various sizes. 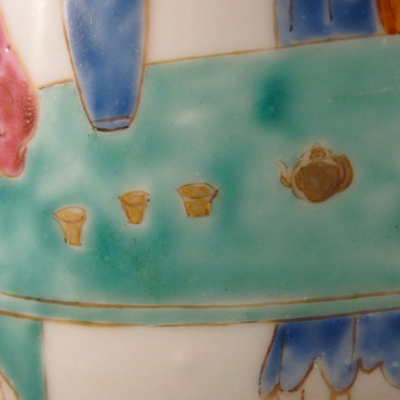 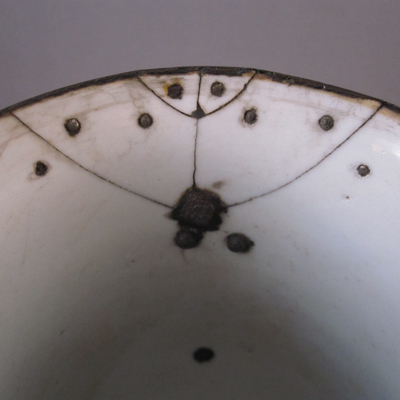 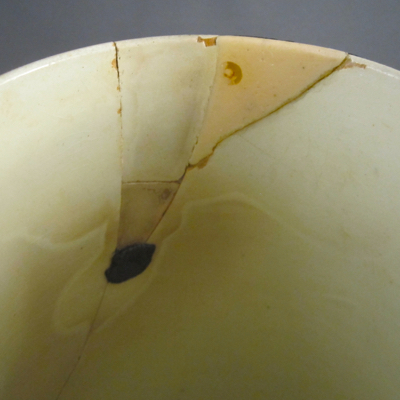 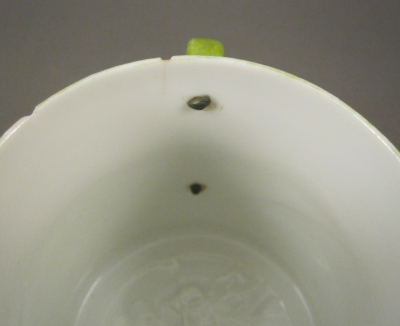 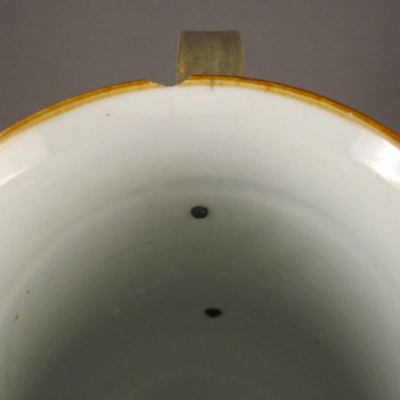 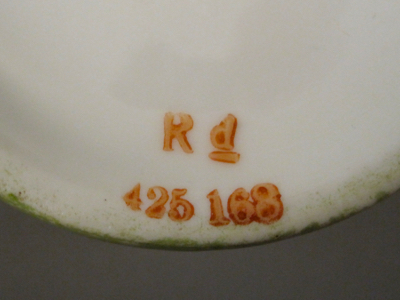 It is more common to find ceramics repaired with staples or rivets, but skilled repairers drilled through glass as well. 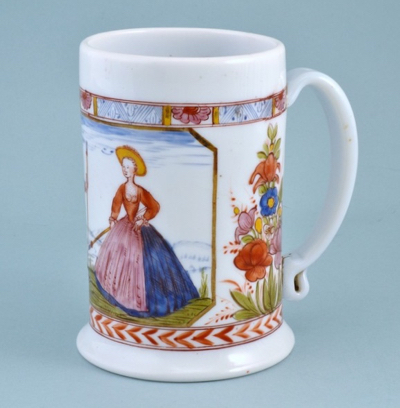 “Bohemia was also renowned for ‘milch glass’ or milk glass, and tumblers, mugs, bottles and such things made of it were decorated with Watteau scenes and floral designs. 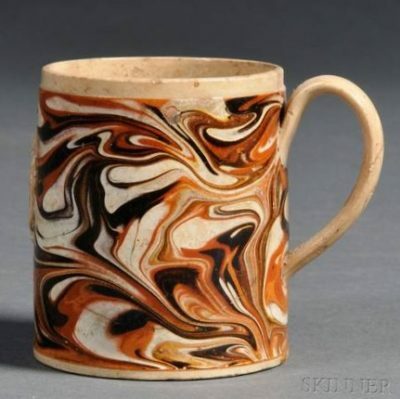 The technique is often good, but the shapes are generally clumsy and the decoration insipid.” From The Glass Collector: A Guide to Old English Glass by MacIver Perciva, 1919. 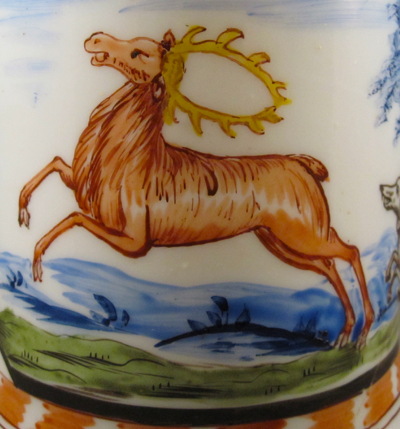 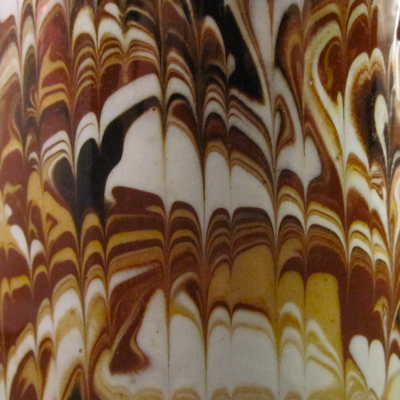 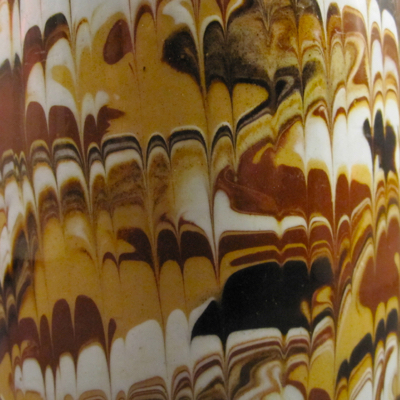 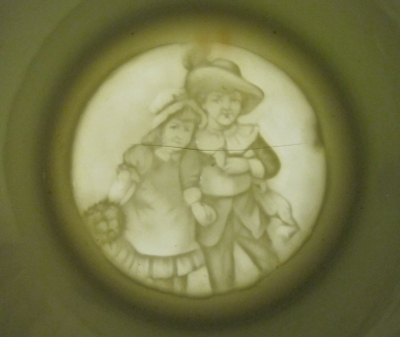 Here’s another example of Milch Glass with similar form and decoration.